Living with a friend is pretty cool, especially a friend who eats multiple avocados a week. A few days back, I came home from work to a note that said "I'm clean" with an arrow pointing to the dishwasher and "eat me" with an arrow directed at the extra-ripe avocado sitting beside the notepad. 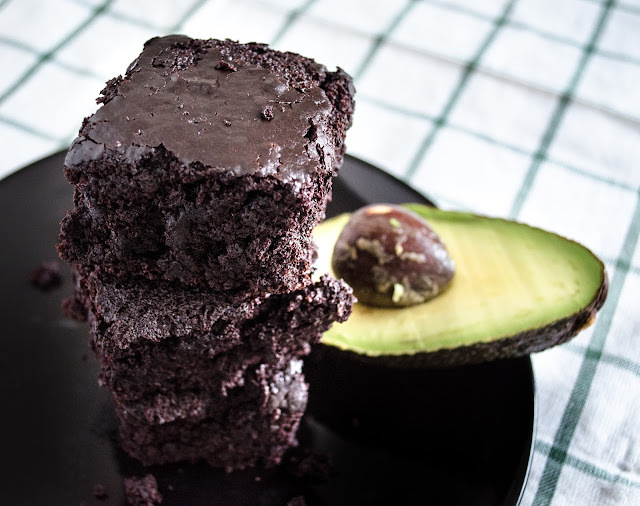 Being that I find it physically impossible to eat an entire avocado in one sitting, I immediately dreamed up chocolatey baked goods. 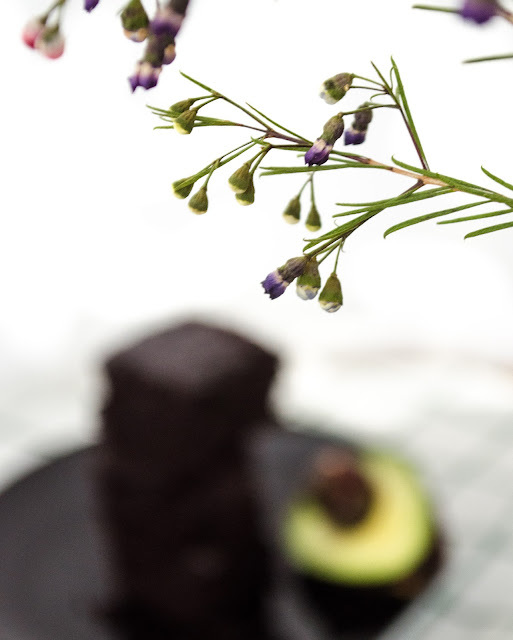 You may remember other times that I used an avocado as a fat replacer in my chocolate avocado cookies, flourless chocolate cookies, and avocado chocolate mousse. Chocolate is the best "mask" for the avocado flavor (and color) in desserts. In my opinion, a vanilla-flavored treat wouldn't look too appealing with a green tint. Maybe one day I'll find a way to include avocado in a non-chocolate treat that tastes and looks as good as avocados are. 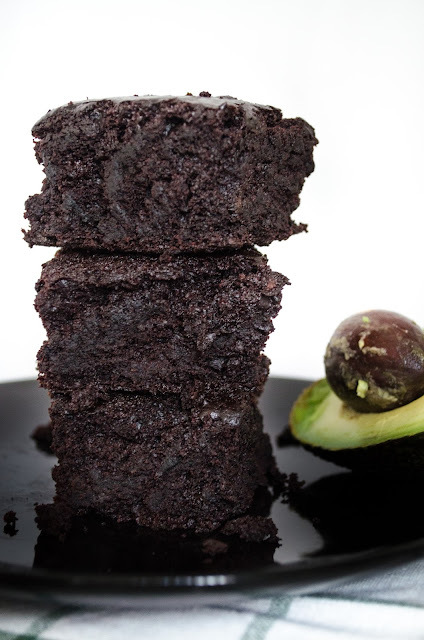 Until then, I'm keeping avocado a secret buried deep within these rich, chewy, and gooey brownies. Preheat oven to 350 degrees and grease a 9" x 13" pan. In a large mixing bowl, combine the flour, cocoa powder, sugar, baking soda, and salt. Set aside. In a separate mixing bowl, whisk together the mashed avocado, olive oil, applesauce, nondairy milk, water, and vanilla. Add the wet ingredients to the dry ingredients and whisk until the batter is smooth. Stir in chocolate chips or chopped chocolate. Pour the batter into the greased pan and bake for 20-25 minutes or until the edges are crisp and a toothpick inserted into the center comes out clean. Let brownies cool before cutting and serving. Store covered at room temperature for up to 5 days. Hello Jessica! Im Paula from Argentina! Tomorrow I will try to make this recipe , I want to sell a vegan brownie in my shop fair " know the earth" , a fair of agroecological - organic products . Please keep me updated on how the brownies turn out and let me know if you decide to use them for a product!